Dr. David Huntsman and colleagues, including Drs. Aparicio, Sorensen and Shah, have identified mutations in a gene called DICER in rare, seemingly unrelated ovarian, uterine, and testicular cancers. When the group began sequencing the genomes of these and other rare tumours, they expected to find different gene mutations in each form of the disease. However, they were amazed to discover that the same fundamental mutation in the DICER gene showed up in multiple tumour types. The findings are published today in the New England Journal of Medicine. Dr. Huntsman was interviewed by CTV about this study; you can view the video clip here or read more about it in the National Post or Vancouver Sun. The research of the team is now working to determine the frequency and role of DICER mutations in other types of cancers and are expanding their collaboration to discover whether mutant DICER and pathways it controls can be modulated to treat both the rare cancers in which the mutations were discovered and more common cancers. 1) Heravi-Moussavi A, Anglesio MS, Cheng SW, Senz J, Yang W, Prentice L, Fejes AP, Chow C, Tone A, Kalloger SE, Hamel N, Roth A, Ha G, Wan AN,Maines-Bandiera S, Salamanca C, Pasini B, Clarke BA, Lee AF, Lee CH, Zhao C, Young RH, Aparicio SA, Sorensen PH, Woo MM, Boyd N, Jones SJ,Hirst M, Marra MA, Gilks B, Shah SP, Foulkes WD, Morin GB, Huntsman DG. 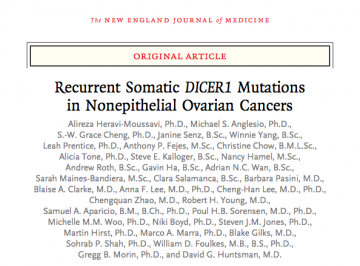 Recurrent Somatic DICER1 Mutations in Nonepithelial Ovarian Cancers. N Engl J Med. 2011 Dec 21.